Town boss Billy Heath admitted the best team won after Halifax lost 1-0 at home to Harrogate. Jack Emmett’s second-half goal condemned The Shaymen to their second defeta in three days after they lost 3-2 at AFC Fylde on Saturday. Heath said: “At the end of the day, the best team won. The first 20 minutes of the game we were second best. 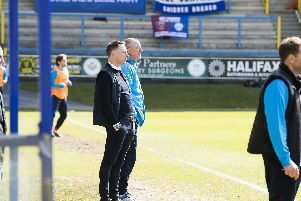 “We came into it in the next 25 minutes and made a fist of it and looked OK.
“The problem we’ve had over the Bank Holiday, and especially in the second-half today, was there for all to see. “There’s too many square pegs in round holes, we’re thin on the ground. We lose Josh Wilde at half-time and we have to stick Kevin Roberts on the left and put Jake Hibbs at right-back. “We’ve already got Scott Garner playing in central-midfield to start with. “We only had a spell for 20 minutes in the match and you’re not going to win (with that). Heath called on his players to take more responsibility in possession and felt they played too many long balls forward. “We didn’t play at all second-half. We went far too quickly too long,” he said. “We lost cohesion with the replacements but we need to be better. “I’ve said to the players we need to be better, we need to be braver on the ball. “When it’s not going great you need players that want to get it down. It’s an easy option to go long and we did that today. However, Heath did praise the finish from Emmett that won the game. “The finish was fantastic,” said the Town boss. “If you had two keepers you’re not going to save it, it’s a great strike. Left-back Josh Wilde limped off at half-time, and Heath was left to reflect on a miserable Bank Holiday for missing key personnel. “Josh has got damage to his toe. We’ll have to see where we are with that,” Heath said. “The Bank Holiday period has come at the worst possible time, the two games in three days is the worst thing we could have asked for. “Nathan Hotte returned today but we were missing Liam King and Cliff Moyo.